Another lovely photo received from Tom Cosens from Yorkshire (UK) of an old car he didn't recognise. This is from his collection of postcard curiosities on which he has no other background but which are needing identification. -- I has seen one like this before but could not remember what it was. Our John Warburton/Tim Harding/David Hales had some other photos of BT 185 (registration is East Riding of Yorkshire CC) and identified is as a Brown Bros cca 1904 Brown 8'10, then costing £220.00. A couple of lovely photo received from Stuart Andrews (UK) who lectures on cruise ships on travel and transport. 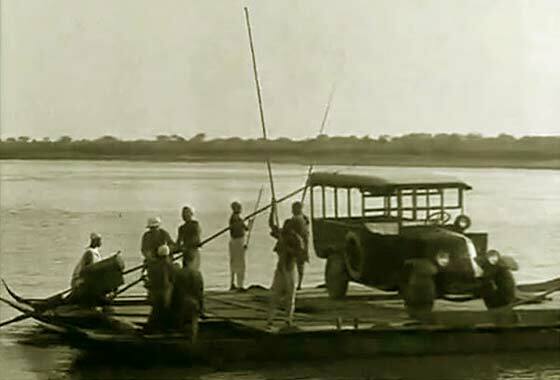 One of the talks is on early cars and their impact on culture and society, but is unable to identify the cars concerned. 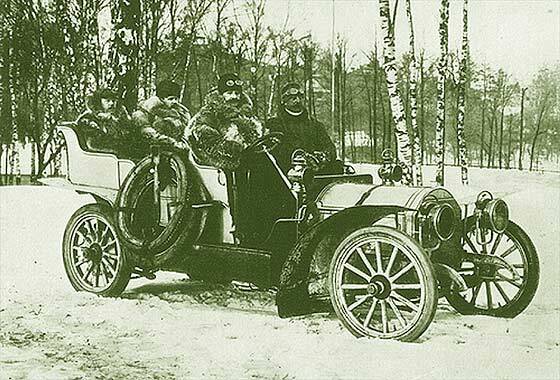 -- Initially thought Mercedes or FIAT and eventually advised by our colleague Casper Friedrich that it is a cca 1907/8 FIAT, perhaps the 50'60 Tourer, driven by FIAT agent Emil Salmson at the Swedish winter race Stockholm-Gothenburg about 1908. 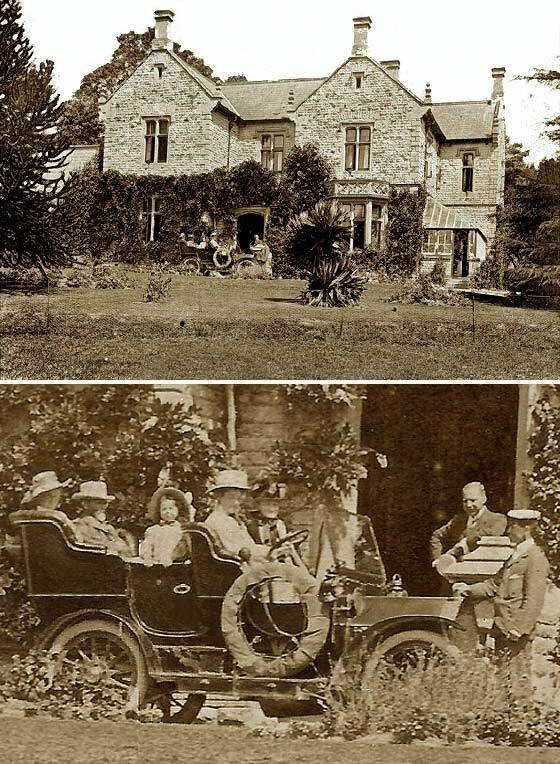 A photo received from Steven Everitt (UK) on a postcard dated April 1911 but from the foliage, attire of the people and the open windows, perhaps summer 1910 or earlier. Is it a Talbot? The person who gave him the postcard thinks it a Rolls-Royce, so our identification could help settle a good-natured disagreement! -- Not a Talbot as entirely different rad and, for same reason, definitely not a Rolls. 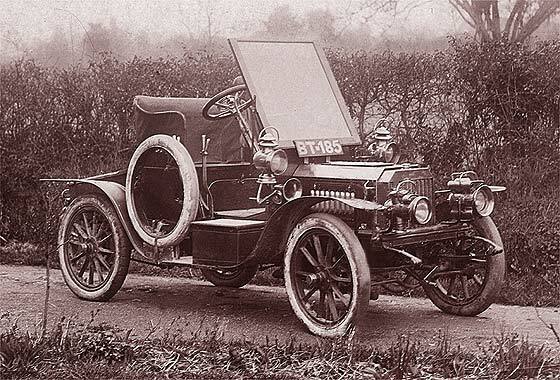 Quality car by at the time one of largest UK car makers, a cca 1908 Humber 15 Tourer. A couple of lovely photo received from Stuart Andrews (UK) who lectures on cruise ships on travel and transport. 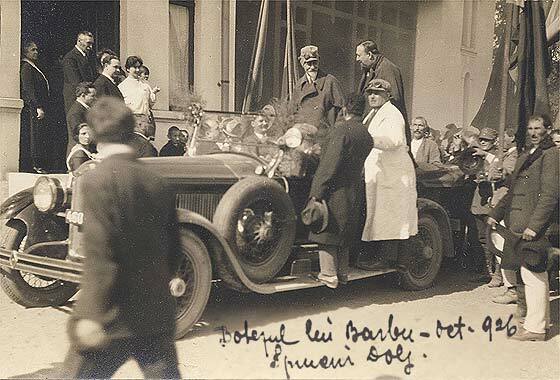 One of the talks is on early cars and their impact on culture and society, but is unable to identify the cars concerned. -- British made by company making trickles in 1884, became the Rover Cycle Co in 1896, and had made nearly 1500 motorcycles by 1905. 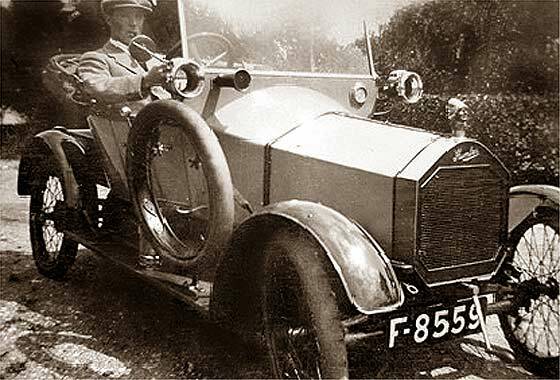 They won the car Tourist Trophy 1907 with a heart shaped radiator, which was repeated on this cca 1909 Rover 15 Tourer. A photo received from Geoff Procter, Wiltshire (UK) asking if we can help to identify this further? 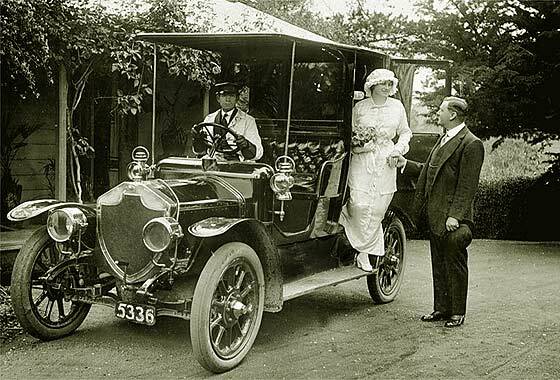 It was from a collection of photos owned by James (Jim) Thomas (1891-1955) of Lewisham/Bermondsey who ran a car hire business just after WWI. 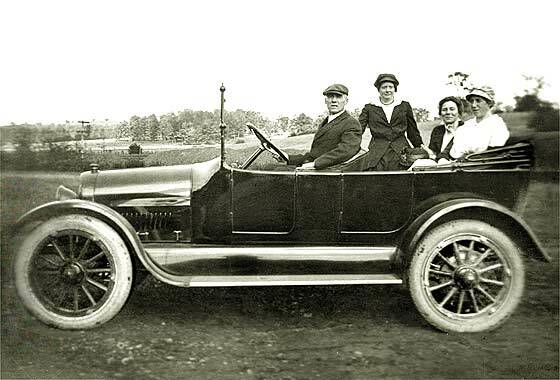 -- The vehicle registration was issued by Essex County Council in very late 1913. The car is a Humberette. 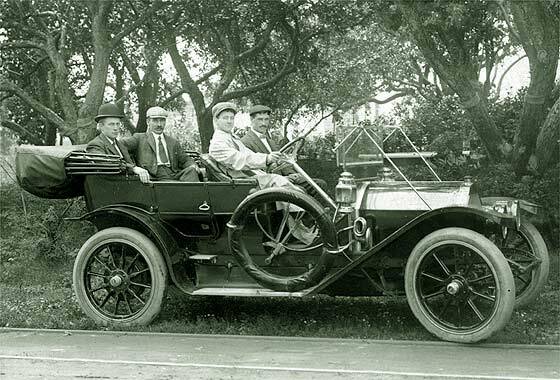 Initial models were 998 air-cooled twins but a water cooled 'Improved' version was introduced end of 1913 as a 1914 model. Another photo received from Geoff Procter, Wiltshire (UK) from a collection of photos owned by James (Jim) Thomas (1891-1955) of Lewisham/Bermondsey who ran a car hire business just after WWI. 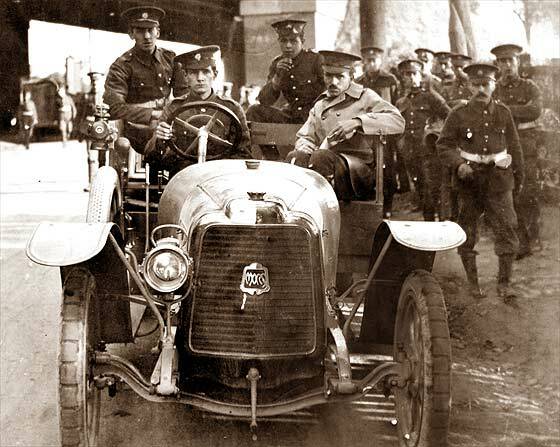 This is him driving a Mors 30th September 1914. -- Mors radiators of the period had flat fronts hence we are a little concerned about the dating. No numberplate. Commercial tender body. Likely a Mors 12/15HP, 2121cc. 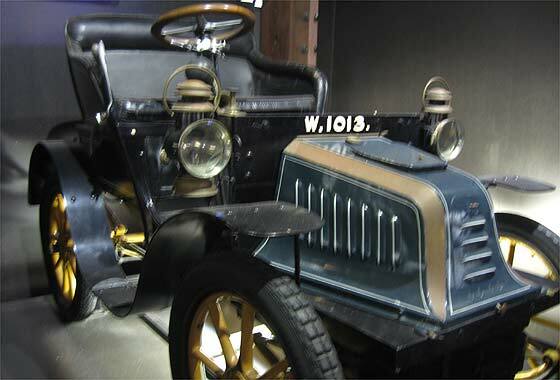 Perhaps rounded radiator was new for 1915 models? Another batch of fascinating photographs from our regular contributor Cicos Florin in Constanta by the Black Sea (Romania) who is interested in old cars of Romania. Do we know what this is? -- It is interesting that Flor keeps coming up with pictures of mostly American vehicles in Romania. This one makes a nice change, not being one. Made in Turin, Italy, by Fabbrica Italiana Automobili Torino, and is a cca 1909 FIAT 505 Coupe-de-Ville, with the driver out in the cold under a canvass roof. Another lovely photo received from Tom Cosens from Yorkshire (UK) of an old car he didn't recognise. This is from his collection of postcard curiosities on which he has no other background but which are needing identification. Grateful for any help. Thinks may be American.-- Sure is. The wheel hubs suggest the make, no bodywork separator behind the front seat, coupled with multiple bonnet louvers, limit the year. 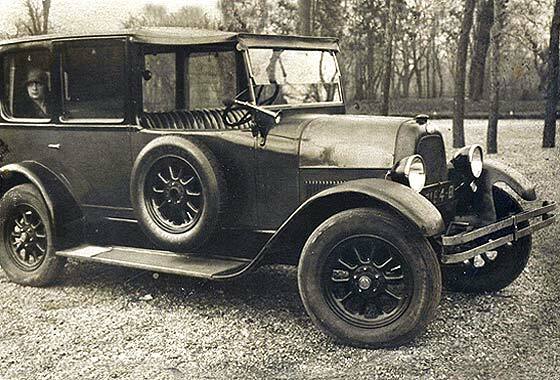 This is a cca1919 Reo the Fifth 30'35 Touring, strangely labeled The Farewell car? A lovely photo received from Paul Benjamin (UK) showing his grandfather at the wheel possibly taken in Germany (where he grew up) or in the UK (RHD?) after he moved here in the mid 1930s. -- It is an AGA, not the Swedish kitchen range cooker, but the product of the German Autogen Gas Akkumulator company making oxyacetylene accumulators. Founded in 1915, gone by 1929. This is a cca 1920 AGA 6'16 photographed in Germany ( plates ) and with a damaged rear wing. Another photo received from Geoff Procter, Wiltshire (UK) from a collection of photos owned by James (Jim) Thomas (1891-1955) of Lewisham/Bermondsey who ran car hire business after WWI. Believed to be a 1910 Studebaker hire car in Bermondsey?-- Nearly, plus 15 yrs, this is a cca 1925 Studebaker Model EQ Special Six Berline. Note US sidelights on bulkhead and additional UK sidelights on mudguards, and optional disc wheels. Special Six has a fluted radiator shell and bonnet. 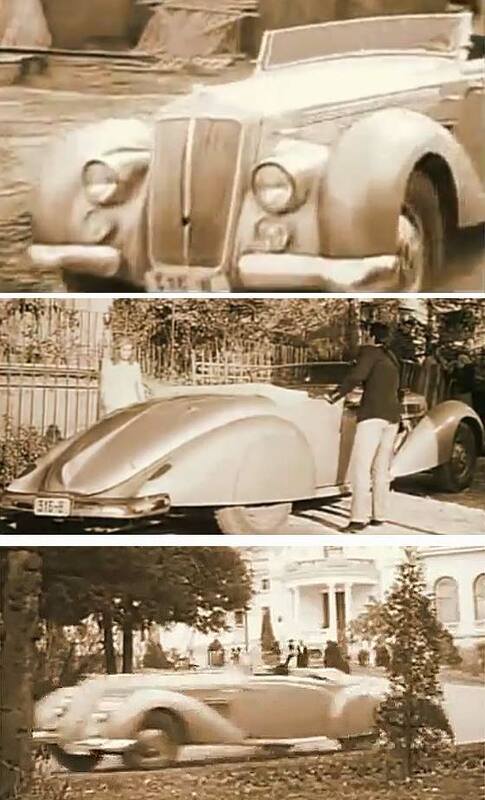 Cinema screen grab of a Vehicle which appeared in a French documentary "Les Statues Meurent Aussi" (Statues Also Die) made in 1953 where the vehicles are being investigated by IMCDB. The documentary was about historical African Art and the effect of how colonisation had an effect on how it was understood. -- Scuttle radiator, slightly rounded but flat front mudguards with overhangs, and the lights not higher than mudguards suggest cca 1925 Renault OS Bus. Another batch of fascinating photographs from our regular contributor Cicos Florin in Constanta by the Black Sea (Romania) who is interested in old cars of Romania. -- Photo is titled 'Averescu'. Alexandru Averescu (left with white beard) was a Commander in WW1 and twice became Prime Minister of Romania under King Ferdinand I. 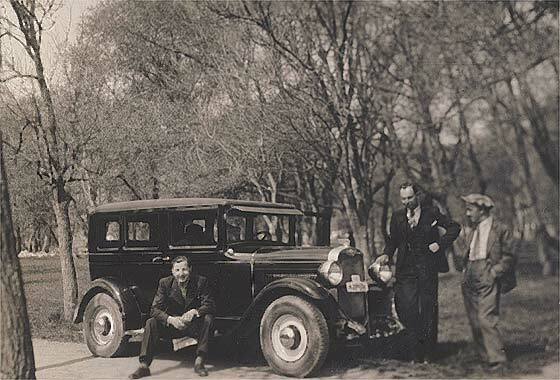 As this is a cca 1926 Buick Master 6, the photo was probably taken during the 1926 elections, becoming Premier. Became Marshall of Romania '30, died '38. Cropped photo received from Tom N of Watsonville (USA) of downtown section of Watsonville, California, He is trying to figure out the year of the picture based on the year of the cars in the photo. 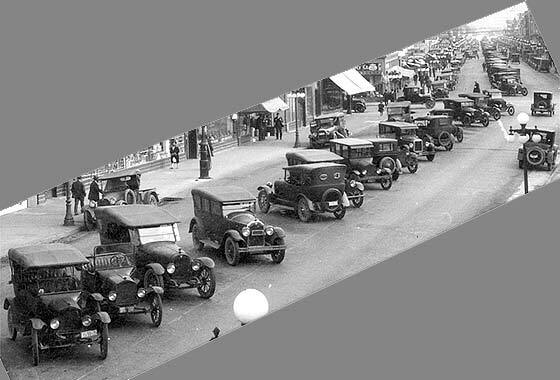 -- The two Model T Fords on left are pre 1920, similarly with the Hudson next to them, but the Buick next to that has to be at least 1925. There is nothing much visible there that is newer. Photo could be more recent but all cars look same age and period so we would go for approx. 1926 , not much later. 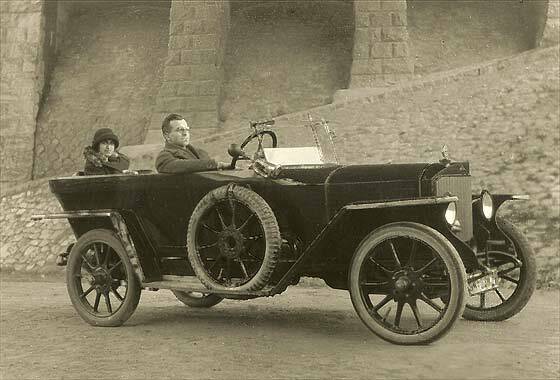 Another batch of fascinating photographs from our regular contributor Cicos Florin in Constanta by the Black Sea (Romania) who is interested in old cars of Romania. -- It is interesting that Flor keeps coming up with pictures of mostly American vehicles in Romania. This is another one. Made in Detroit Michigan USA by a company which had only been around for about four years. Difficult to say if this is a two-door or a four-door but by the bullet headlamps it is cca 1927 Chrysler 60 Sedan. Tiny blurry low res photo received from Robin Aikman (UK) saying this photo was taken by his father at Lynmouth in Devon when he was on his honeymoon in 1930. The car might be a Lea Francis? -- Can I please repeat the request to send photos at BEST RESOLUTION possible, as it is the detail that provides the identification. A 3 x 2 x 72dpi 17KB photo does not help identification. 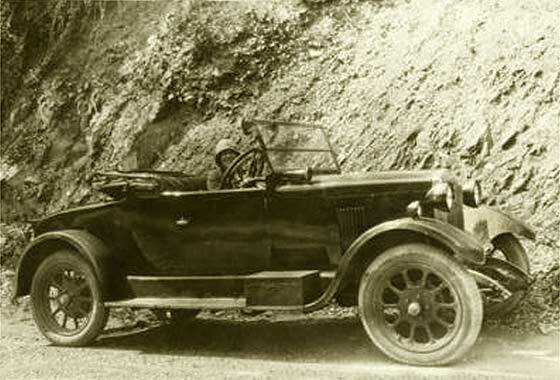 Fortunately when enlarged, enhanced and sharpened there is enough to say cca 1927 Rover 10'25 Two-Seater. Another batch of fascinating photographs from our regular contributor Cicos Florin in Constanta by the Black Sea (Romania) who is interested in old cars of Romania. Do we know what this is? -- It is interesting that Flor keeps coming up with pictures of mostly American vehicles in Romania. This is another one. Made in Michigan USA by a company named after a Swiss born French racing driver who had by that time left the company. This is a cca1928 Chevrolet National Model AB Sedan four. Another photo received from our regular contributor Raoul Rainer from Stuttgart (Germany) from a batch of photos he purchased recently and has on line. Do we have any idea what it is? He recognises the louvers but cannot place them. -- Registration seems of the UK pattern but too many numbers so perhaps Colonies. Text on back is Dutch, so perhaps South Africa. Boy Scouts in the background. Car is American with Pennon bonnet louvers so is a cca 1930 Chrysler Series 77 Phaeton. 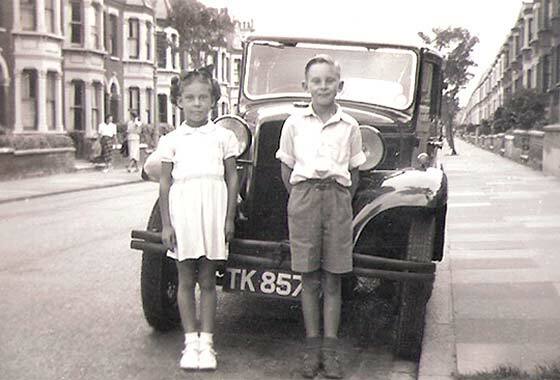 Photo received from John Dixon (UK) asking if any chance we might identify his father's old car? Reg TK 8570 did not help. Photo taken of him and sister in 1947. 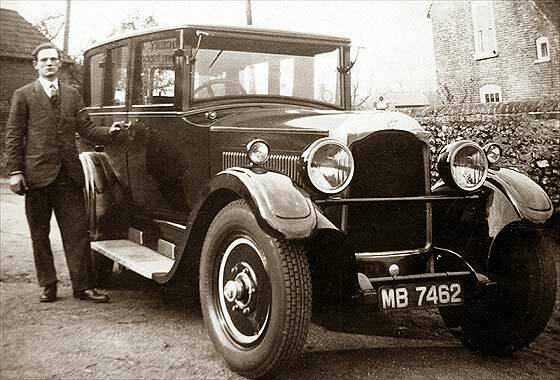 -- Light British car with registration issued by Dorset County Council in 1932. Identification feature is the light bar between the rad and mudguard but not across the front. Our Tony Oakes spotted immediately it was a cca 1932 Hillman Minx Saloon. Introduced in 1932-47, 1185cc four cylinder sidevalve, 30BHP, £155.00. Another photo received from our regular contributor Raoul Rainer from Stuttgart (Germany) from a batch of photos he purchased recently and has on line. The bodywork looks German, but not the car. Could it be an American Car with a German body. Do we have any idea what it is? 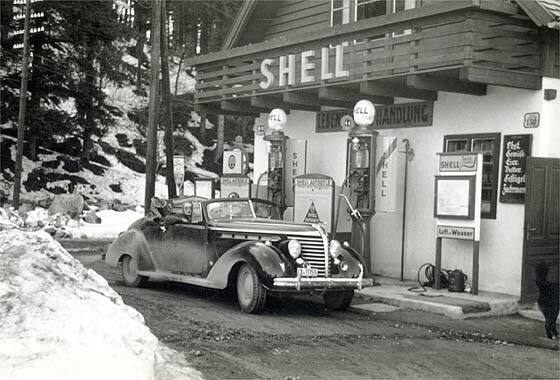 -- We had quickly identified this as a cca 1938 Hudson 8 Special Sports but Raoul came back almost immediately advising he had actually identified it himself. We will nevertheless count this as one of our identifications ! Another photo received from our regular contributor Raoul Rainer from Stuttgart (Germany) from a batch of photos he purchased recently and has on line. 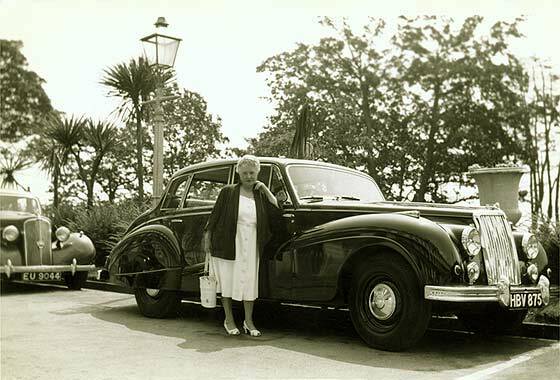 He knows the car on right is an Armstrong Siddeley Sapphire. What is on the left? -- Sapphire registration is 1956 issued by Blackburn CBC (Lancashire). Registration of car on the left was issued by Brecknock County Borough Council (South Wales) in 1948. Seems to have three windows suggesting this is a 1948 Humber Hawk Mk2 Saloon. Help requested from Jean-Claude Lebec (Belgium) who is a model car collector and builder, who is about to build a model of the 1953 Triumph TR2 that broke the speed record in Jabbeke, Belgium, in 1953. -- Mike Ellis of the TR Register, kindly advised the colour was called Ice Blue, which was in reality, a light greyish green. The only colour code reference that he had was ' Dockers BF4575'. Good model can be seen on the website of one of their Dutch Members Raymond van Donk. 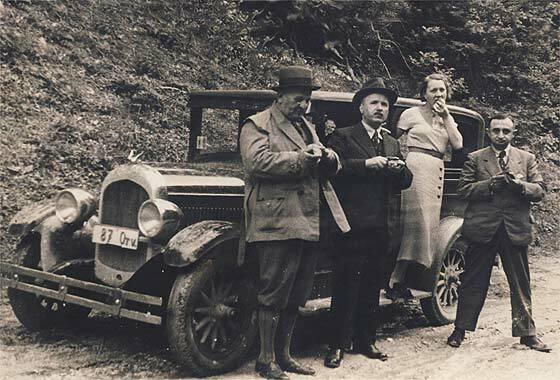 Another photo received from Adrian Pascu-Tulbure (UK) relating to a blog on historic cars of Romania. -- Seems a screngrab from a 1965 Franco-Romanian film "Star without name" shot in Czechoslovakia and Romania. 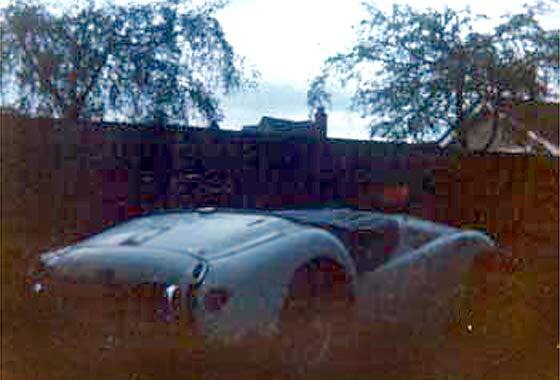 Coachbuilt car, European appearance, mid 30s, identification features not clear. 1933 Skoda had a fintail boot!! What seems quite wrong is a hole in the middle of the rad; false, made for film? So poss Amilcar, Bugatti, Salmson, Delage, Delahaye, Horch, Lancia, Daimler?? 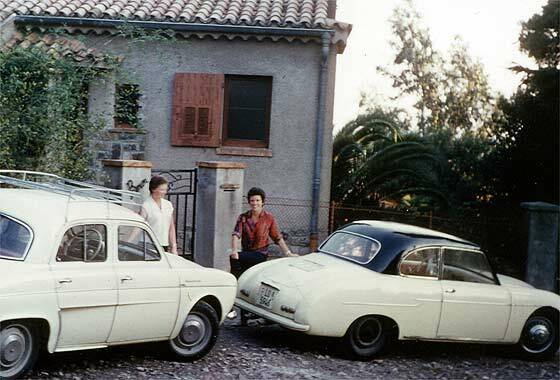 A photo received from Thomas Horat (Switzerland) aking us to identify the car on the right. Photo was taken in 1961/2 in France (St. Raphael) during the honeymoon of his parents. The woman is his mother. -- Great puzzle this one, and none of our experts or external contributors could name the car. 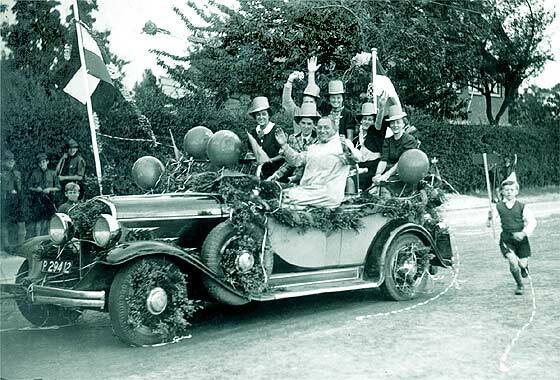 There were a great number of Volkswagen and Porsche bodybuilders, and as reg is Lucerne, a good guess is it could be Swiss, from nearby Thun, cca1955 Beutler, horizontal grille, so pr Volkswagen.